I got a good night's sleep and had an easy day at work today so I have had time to write up my report. You can find it at Mike Day's NC Ultra site as usual. Click Here for a direct link to the story. Overall it was a great trip, a great race and a great time. I did take the camera and have some pictures from pre-race as well as during the early part of the day along the course. You can find the photos here. They do a wonderful job with this event and I would recommend it as a race to add to your list of things to do. Every Ultra I enter has a purpose. Sometimes as a training run, others more for the social aspects or the scenery or a unique challenge. And then sometimes I just want to run fast. Rocky Raccoon has a reputation of being an easy 100 miler and a course for a fast time so I went down to Texas for the express purpose of putting out a strong effort and hope for a PR. 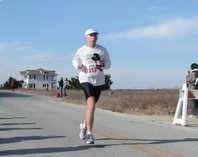 However, there is really no such thing as an easy 100 miler, especially if you are racing and not just trying to finish. I arrived in Houston around 3:30pm on Friday and made the drive up to Huntsville State Park, arrivng a little late to hear all of the pre-race briefing but just in time for the dinner. The pasta dinner was very good and it was nice to see several friends and meet a few new folks. Especially nice to see the lovely ladies Beth, Xy and Catra. Frank Probst, the first person I met at an ultra in 2002 was there going for another over 60 win and also Bill and Luanne from the VHTRC. I sat across from Mike Smith from Indiana who was a total stranger on the trail at Massanutten in 2005 and had loaned me a light when mine faltered. My Trail Princess, Anita couldn't make it to the dinner. I had seen Marie Lewis, from the Mangum Track Club at the airport as we were on the same flight but I missed seeing her at the dinner. Marie would be trying for her first 100. After eating ,I organized my drop bags and decided I would just use one at the lodge. I didn't really need anything anywhere else and I would have to leave for the airport Sunday morning before it could be returned anyway. I was really expecting some warmer weather in South Texas but after checking online for the forecast I'm really happy I packed some warm clothes. The temperatures would range from about 26F to 53F over the weekend. I had not had a chance to see any of the course other than some photos. We were warned of some muddy sections and I had read as many reports as I could find and they all warned of the roots on the course. I was planning to use a pacing strategy of 10 minutes running and 2 minutes walking but I knew I would have to make adjustments for the trail conditions. It was in the upper 20's at the start but I just wore shorts and a long sleeve shirt with a vest as I knew it would be warming up as the sun arose. We started promptly at 6am and I found myself well back in the pack. It would be another hour before sunrise but I chose not to use the light I had in my pocket. There were so many runners with lights and we were bunched together so I could see fine and the first section of the course was not technical at all. I was able to catch up with Anita after the 1st mile or so and ran with her for quite a while. It was difficult to get into a rhythm until I neared the first aid station so I decided not to start with the pacing strategy until I got there at about the 4 mile mark. So far the trail was in good shape. The soil is very sandy and drains well. The mud I did encounter was easily avoidable except one messy spot at Amy's Crossing. I then settled in to my pacing plan from that point on. There are some hills on the course but none are steep or long at all. Nothing compared to the hills I usually train on so I was running up the hills on the first lap. The section leading to the Dam Road aid station was quite nice with not much in the way of mud except on the short dirt road section and it was again easily avoidable other than a few splashes. By this time I had decided I wasn't too impressed with all the horror stories of roots. Yeah, there are roots but anyone that runs single-track in NC and Va where I do most of my running wouldn't have a problem. Well at least during the daylight. Even though I have run on trails for over 25 years there are times when a root can sneak up on you and at night they will slow you down quite a bit. As I left the Dam site and headed to the Farside I was feeling great and it was turning out to be a beautiful morning. Already the leaders were coming back toward us on this out and back section and they were flying along. I was pretending to fly too and having way too much fun. Just out of curiosity I counted the runners ahead of me as they came back until I reached the turn around. I was a little surprised that I counted about 100. I was at 20 hour pace and I knew there was no way 99 other people were going to finish under 24 hours. So I just kept cruising along and taking my timed walk breaks and doing my own thing. The only problem with sticking to a strategy is it makes it nearly impossible to run with anyone else and have a conversation. I did get to be in the vicinity of the same people for a while but then I would either move a head or get passed. Now, back to the Farside section. I would soon grow to hate this part of the course. It was to me the hilliest part and was home to the mother of all mudholes. There were a few other muddy parts but again mostly avoidable but this one took a while to creep along the sides to keep from falling in and drowning. Because of the out and back we had to run this section 10 times for a total of about 29 miles, over a quarter of the course. The next section after returning to Dam Site I found quite enjoyable; most of the time. It was the longest at I think about 4.6 miles. It was mostly single-track through a pretty part of the park. This area probably had the most concentraion of roots but during the daylight it was no problem for me. With about a mile to go to the Site 174 aid station we crossed the swampy area at the end of the lake on a long boardwalk. This next section would be the muddiest part of the course as the trail was in a low area alongside the lake. I think the Park should probably re-route the trail to slightly higher ground just a few feet further away from the lake and this could be avoided for all park visitors. After leaving Site 174, the last 2.9 miles back to the lodge was probably the easiest section and I begin to look forward to it each lap. I completed the first lap in 3:45, almost exactly what I had predicted and was feeling great. I snapped a few pictures along the way while I was taking the walk breaks and I would carry the camera one more lap so I could get a picture of all my friends that were running if possible. I removed my vest as it was now warm enough for just my shirt. Lap two was fairly uneventful. I was able to run a little with Anita again before she pulled away for good.It was warming up into the 50's and was perfect for a run in the woods. One thing that surprised me was I was still being passed by people on the 2nd lap. I'm still at 20 hour pace with nearly 100 in front of me and folks are still going by. A lot of them were in the 50 mile but several were 100 milers. All I could think was there was going to be a lot of miserable people by night time. By now the leader had already made a big gap on his competion.. Anton Krupicka was gliding over the trail and from where I saw him heading out to the Farside I estimated he would hit 50 miles in about 6:15 to 6:20, well on his way to a chance at a course record. He lapped me a short while later as I was near the 35 mile mark for me, 55 for him. I made it back around to the lodge in about 4:15, a little slower than I hoped but I was feeling great. I ditched my camera grabbed a snack and headed out for lap three. I had put my back-up light in my pocket because I knew it would be near or after sundown by the time I completed this lap. After about two miles, the womens leader, young and beautiful Jenn Shelton lapped me with her pacer. She was at mile 62 and I was at 42 as she was on her way to shatter the womens record by over an hour. If this young lady could swing a tennis racket as well as she runs she would be one of the richest women in sports with all the sponsors she would attract. I continued running well. By 50 miles I had abandoned my earlier pacing strategy. It had served it purpose in getting me halfway in good shape and on pace for my goal of 22:30. For the remainder of the race I would run as I felt and the terrain would allow. I ate a slice of pizza, the first real food I had eaten all day and sat for about 5 minutes at Dam Site around the 53 mile mark. It was enough to take away the hunger pangs. Otherwise my energy level was good all day and my stomach was happy. It did get dark enough to need the light the last 2 miles coming back to complete lap three. I stayed at the lodge just long enough to put my vest back on, change socks and grab my main light and head back off into the night. Lap three had taken 4:34, just a few minutes slower than I hoped but I still was on pace overall but I knew the night would slow me down and it would not be easy. I went out determined to run as much as I could and as fast as I could. It's a funny thing how our perceptions change during the course of a long run. I know I was putting out the effort and I was running nearly as much now as I had been earlier but my watch kept telling me I was running much slower than I thought. I knew this was inevitable so I was determined not to let it get me down. Part of the problem was dealing with the roots of course. I had to pick my way more carefully in the dark. I was lucky to only fall one time as I switched my flashlight from one hand to the next. I stumbled a couple of other times but mainly they just slowed me down. I ran as hard as I felt I could but my time for lap four was 5:11:12 . I put on my jacket before heading out for lap five as it was getting colder than predicted and returning to the mid 20's. With the slower than expected fourth lap it would take a miracle to run 22:30, I would have to run the last lap in 4:40, a full thirty minutes faster than lap four. As hopeless as it seemed I was determined not to give up. I still felt pretty good and I came here to run hard, so I left the lodge for the last time intending to leave everything I had out on that trail. As I reached each aid station I just grabbed a drink and swallowed it down and then was out again, not even looking at my watch. I kept this up until approximately mile 90 at the Farside. I had slowed even more from my pace and my goal was beyond me now but I still was shooting for a PR and that was defintily within reach. I passed Anita just before the turn so we wished each other good luck and off I ran into the dark still pushing for every second I could hope for. As expected I had been steadily passing people during the night and although I had slowed so much I was still passing others as they bravely continued to struggle to their own personal goals. At this point I was ready to get this thing over with. It was so tempting to slow down, walk more, sit at the aid stations and eat, and still get a PR. But I pushed on wanting to run as fast as my body would allow. When I finally crossed that finish line, I was totally spent but proud knowing I had given my best effort. The Directors and all their volunteers and sponsoring running clubs did an outstanding job of putting on this event and if possible I hope to return someday. Until then, on to the next one. I read your report....what was your final time? I assume a PR from the tone of your report....but the actual time was missing.